I thought this was a great SotU speech on the heritage and vision of freedom and greatness for the nation. Nice job honoring the WW2 vets and Holocaust survivors as well as the police officer that stopped the synagogue shooting. Good honoring the 10 year old girl. Good for standing up to infanticide. Good for rebuilding the military and pointing out the threat from Russia and China. The $1.5 trillion in "infrastructure" spending? What's another $1.5 trillion when you're already $21 trillion in the hole? After all, we can't be out of money, the printing presses are still running! Great nations don't fight endless wars but they also don't retreat from them. If we stop playing World Police, we all know which two countries will step into those power vacuums. I liked the slams against Socialism. I just wish it would stop being given to us inch by inch. Is that really too much to ask? “I don’t even know why he wants to come and give the State of the Union,” Waters huffed to Essence magazine. “The state of the union under him has not been good,” she claimed, dismissing record low unemployment rates for black Americans and strong economic activity. Waters isn’t the only one triggered by Trump. Last year, Luis Gutierrez, the illegal alien-loving congressman from Illinois, fled the House chamber. 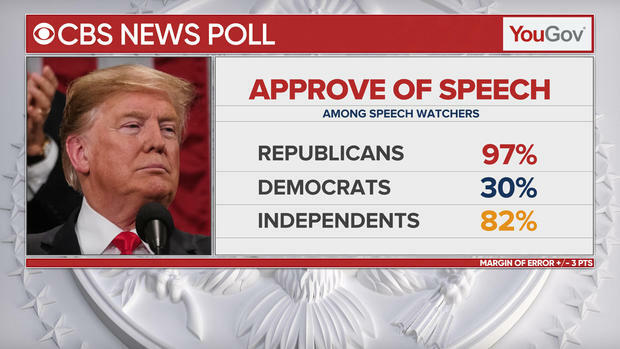 SNAP POLL: How Do You Rate Trump’s State of the Union Address? I 100% liked 75% of the SotU. I know I'm late to the thread. I can't listen to politicians. Its all a bunch of self serving drivel. I just listen to the highlight reels.